DeVos’ ‘Rethink School’ tour gets panned by educators and public school supporters: DeVos uses tour to slam public education and drum-up support for private and religious schools. Scroll to the bottom of the article to find out how to take action against the Betsy DeVos privatization agenda. Basically, call your Congresspersons and let them know your views..
A public school should be defined by the fact that public schools are governed and administered publicly. 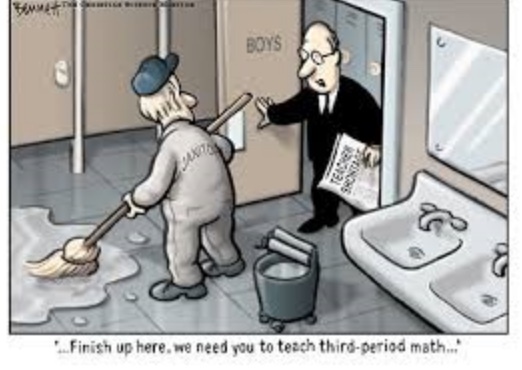 The charter school industry has attempted to redefine themselves as public schools because they receive public funding but they quite simply are not public schools because they are governed by non-profit and for-profit corporate managers who are not publicly elected and who are not responsible to the community but to their own special interest. Charter schools ARE NOT public schools as much as they would like to brand themselves in this way, they are not accountable to voters and yet they receive public tax funding. The National Labor Relations Board labelled them government contractors. Saying a school is public does not make it so. Actually, Dr. Phillip D. Ortego y Gasca is 91 already since I'm a little over a year in posting this. All of us in Mexican American Studies owe so much to this scholar who is a beloved, national treasure. Where would we be without scholars like him that are the reason and continuing inspiration for "The Chicano Renaissance?" To Dr. Ortego's credit, Backgrounds of Mexican American Literature, authored by him in 1971 by the University of New Mexico Press, is foundational for what is known today as "Chicano literary history." In today's post, he remarks, "with longevity, comes opportunity." And on top of this, is a gracious, beautiful human being that so many of us know and love. We are not only fortunate, but indebted to pioneers and warriors like him that have fought, and continue to fight, the good fight. We love you, Felipe! And a very belated, but nevertheless heartfelt Feliz cumpleaños! Thank you for being who you are and may God grant you many more years of a life of the mind, body, and spirit! Every calendar holiday, Dr. Felipe Ortego y Gasca sends an email to his colleagues at Western New Mexico University. The email is simple and includes an attachment with a short write up. Ortego, a professor of English and the university’s Scholar-in-Residence, is sharing thoughts on history and social issues he feels are important to his readers. Now he’s turning 90, and he finds himself the same way he has for several years, behind a computer screen and a keyboard, contributing his ideas on current issues important to culture and society. Considered the principal scholar of the Chicano Renaissance, Ortego is the founder of Chicano literary history having written the first study in the field, Backgrounds of Mexican American Literature, in 1971. Before turning heads with his alternative perspectives on Chicano literature, Ortego began his colorful life as the child of a field worker in Chicago. He served during World War II as a Marine and his worldview was formed from his travels through Europe. Post-war, Ortego served a ten-year tenure as an Air Force officer during the Korean Conflict and the early Vietnam Era. He found his passion in the high school classroom, first teaching French, and then finding his identity as a professor of English. Several decades of teaching and serving in administrative academic roles, Ortego continues to influence students, activists and opinion leaders with the written word. His latest birthday is only the most recent in a long list of milestones. He has appeared in a major motion picture, written plays and was the fifth Mexican American in the United States to hold a Ph.D. in English. And it has all been sprinkled with controversies along the way. Ortego is well known in New Mexico and Texas as an activist, speaking for those he feels are marginalized and championing for Mexican American representation in literature. He organized the Chicano Caucus of the National Council of Teachers of English (NCTE) in 1968 at a time when there were very few Chicanos in English. Ortego turns 90 years old on August 23 and it is appropriate that he has sent out one of his famous emails marking the occasion, this time reminding his colleagues that with longevity, comes opportunity, and Ortego is taking advantage of opportunities he sees on the horizon to continue to write and influence. He’s not done yet. Check out this informative piece by Ben Chapman, 2017. You may be scared of the Alt-Right. I can safely say that you don’t have to be. Remember that the Alt-Right is a coalition. It doesn’t exist in and of itself, but rather as a collection of other groups too weak to function on their own. Additionally, the Alt-Right is unorganized. Yes, they have the ability to show up to the same place and chant the same things, but when it comes to underlying goals, the Alt-Right is scattered. As long as their group remains the cultish, brash, pseudo-intellectual movement that they currently are, they will never be anything more than glorified internet trolls. Finally, we must realize that this movement is not based on hate. As easy as it may be to ascribe Nazism, Klanism, and supremacism to hatred, this is misled. The Alt-Right is a movement based on ignorance, and it is borne out of failed educations and crumbling social structures. With these facts in mind, and with the Alt-Right’s veil lifted, we can address the problems that lead to this plague. Supremacist ideas won’t ever disappear completely. They will always exist somewhere. But I believe that, if addressed, it one day won’t be a topic worth writing about. According to Chapman's analysis, these folks are little more than "glorified trolls" that could have really benefited from a good education, especially Ethnic Studies. Let’s clear this up, shall we? Compliments of the American Institutes for Research (AIR). Glad that growing your own (GYO) teachers is mentioned, as well as collaborating with teacher preparation programs, supporting new teachers, and increasing teacher salaries. 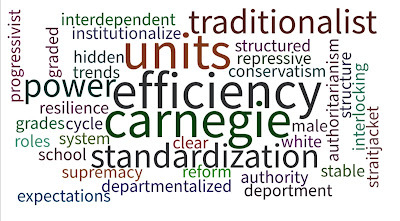 We definitely need systemic, comprehensive approaches rather than piecemeal ones. Outsourcing it as we do to organizations like TFA is not a solution and is even harmful to the profession overall. Not that there aren't some good teachers that come out of this, but for most TFA-ers, teaching is a pass though and not a destination. They also average here in Texas little more than two years in the classroom. Hence, our revolving door. To this AIR report, I'd like to add the importance of having teachers that are culturally relevant and bilingual. So very needed if our profession is to be responsive to current demands. Fortunately, they cite these pieces that should be helpful to those of us concerned with such things of great importance. A whole bunch to digest here, my friends. What Will ESSA Mean for English Learners? English learners (ELs) are an increasingly significant student population, outpacing the demographic growth of non-EL students by more than 40 percent nationwide, and growing by as much as 800 percent in some states. In this blog post, Diane August and Erin Haynes take a look at how the Every Student Succeeds Act (ESSA) helps or hinders this critical student population. 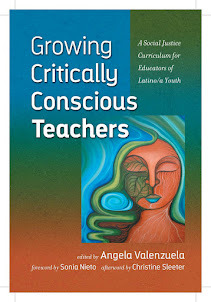 A large body of research supports the idea that Native American, Alaska Native, and Native Hawai'ian students thrive in instructional environments that honor their unique cultural and linguistic heritages. In this blog post, Erin Haynes says the Every Student Succeeds Act (ESSA) promises unprecedented opportunities and funding for incorporating our nation’s many indigenous cultures and languages into public schools if implemented properly. Earlier this month, the first deadline for states to submit their Every Student Succeeds Act (ESSA) Consolidated State Plans passed. Seventeen state education agencies submitted their plans, laying the foundation for states’ educational priorities for years to come. American Institutes for Research (AIR) is conducting an analysis of the state plans as they are submitted, and this is the first in a series of summaries and analyses. Note: Vermont did not include strategies for filling teacher gaps. In my Educational Foundations in Policy class yesterday, we discussed Tyack, D. B. & Cuban, L. “Why the Grammar of Schooling Persists” Tinkering Toward Utopia. It meshed well in my lecture with this piece from NPR that takes a critical look at New Orleans' charters schools titled, "The End of Neighborhood Schools: New Orleans is home to the nation’s first all-charter district. Is this the future of education?" You can read it for yourself, but in a city that has undergone a major restructuring of education with only 10 percent being public and the other 90 being private or charter—and mostly charter—the grammar of schooling persists. Tyack and Cuban narrate a history of American public education as it evolved from a simple to complex, bureaucratic structures, from local to cosmopolitan, parochial to universal, and the like and what we're left with is a stubborn grammar that scarcely changes despite decades of "tinkering" with public education. So here is the Wordl that I generated using polleverywhere.com that my class of 14 students, broken up into groups, generated on the "grammar of schooling" from their readings. These were their takeaways, with the larger letters representing the concepts that best represented the Tyack and Cuban reading. 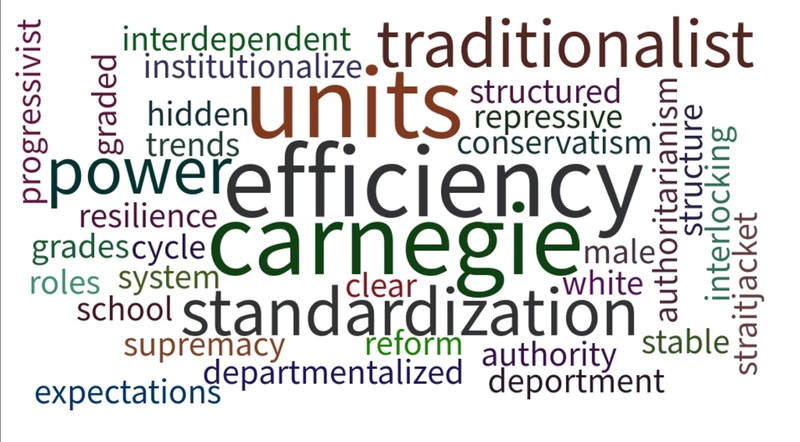 We are delving deeper into all of this too, as well, via Tyack's seminal book, The One Best System: A History of American Urban Public Education. (Cambridge, MA: Harvard University Press). Take note of what is NOT here as major concepts that as we know, float around, in education. These include creativity, curiosity, critical thinking, social justice, equity and the like. You'll have your own thoughts and observations on this, as well. This approach to this reading worked for us, by the way, as it provided us with much food for thought. Hope you find this helpful. Important piece by Rebecca Klein on student and teacher demographics published in the Huffington Post on September 3, 2014. Relatedly, here is another helpful resource titled, Profile of Teachers in the U.S. 2011. Thanks to Dr. Emma Mancha-Sumners for sending this along. We have a huge equity problem here, my friends. A majority of the public school students heading back to school this September aren’t white. But the teachers leading their classrooms are still overwhelmingly so. This year marks a milestone for U.S. public schools in that it is the first time a majority of students will come from minority groups. According to projections from the National Center for Education Statistics, 49.7 percent of students entering public schools this year are white, compared to 50.3 percent of students who identify as black, Hispanic, Asian or another nonwhite ethnicity. Just 10 years ago, in 2004, nearly 60 percent of public school students were white. By 2022, that figure is projected to fall to just 45 percent. But teacher demographics are not keeping pace with the massive shifts in student demographics, and startlingly few educators in public schools are of color. Below are four graphics that illustrate the gap between teacher and student diversity. 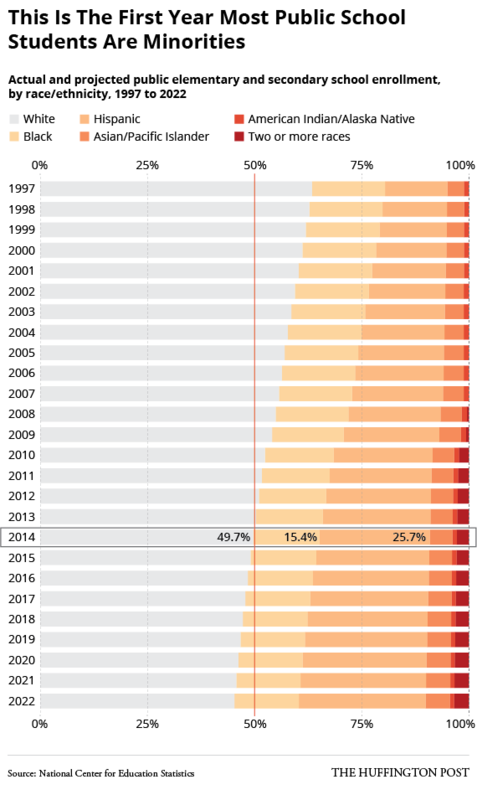 As shown in the graphic below, student demographics have rapidly shifted since 1997, and are expected to keep changing in the coming years. In large part, this is due to the growth of Hispanic populations: Since 1997, the number of Hispanic public school students has nearly doubled. Similarly, the Asian student population has grown 46 percent since 1997, according to the Pew Research Center. 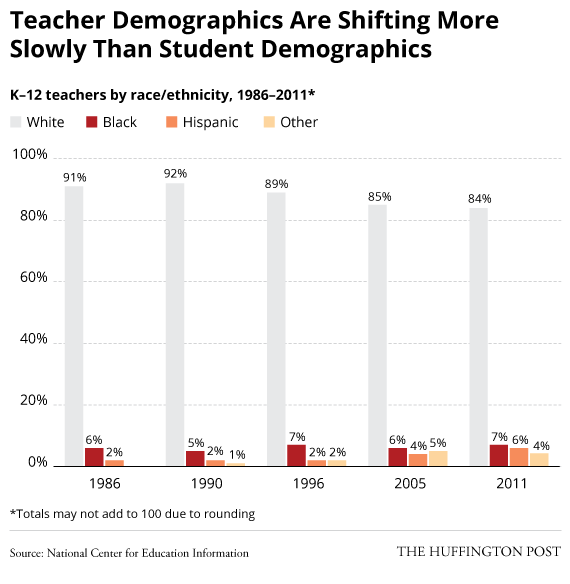 ...but teacher demographics aren’t keeping up. In 2011, 84 percent of public school teachers were white, according to a survey of teachers from the National Center for Education Information. This wasn’t much of a change from 25 years before, in 1986, when the survey found that 91 percent of teachers were white. Department of Education numbers reveal a similar trend. In the department’s latest School and Staffing Survey — a nationally representative survey of public school teachers and principals, most recently conducted during the 2011-2012 school year — 82 percent of teachers reported identifying as white. Nearly a decade before, in the 2003-2004 survey, 83 percent of teachers reported identifying as white. Not a single state has equally diverse populations of teachers and students. Every state in America has a higher percentage of students of color than teachers of color, according to a “Teacher Diversity Index” included in a 2014 Center for American Progress report. The index uses Department of Education data to pinpoint the percentage-point difference between teachers of color and students of color in each state. As highlighted in the map below, some states have particularly egregious demographic gaps. For example, in California, only 29 percent of teachers are nonwhite, compared to 73 percent of students. 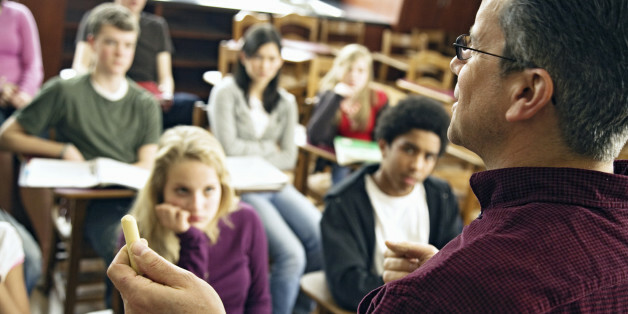 Some programs do a better job of recruiting minority teachers than others. 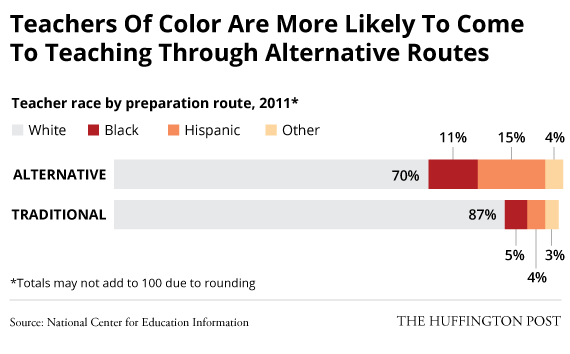 Teachers of color are more likely to enter the profession via alternative preparation programs than through campus-based traditional preparation programs, according to a 2011 survey from the National Center for Education Information. The definition of an alternative preparation program varies by state, and according to The Hechinger Report, an education news outlet, what is considered alternative in one place might be considered traditional in another. Typically, alternative programs allow teachers to enter the classroom with minimal training. Some alternative preparation programs, like Teach for America, have had great success in recruiting minority teachers. This year, half of all new Teach for America recruits are people of color. Kate Walsh, president of the National Center for Teacher Quality, says she thinks alternative programs do a better job of recruiting minority teachers. Other education experts have argued that the problem lies not with recruiting minority teachers, but with retaining them. 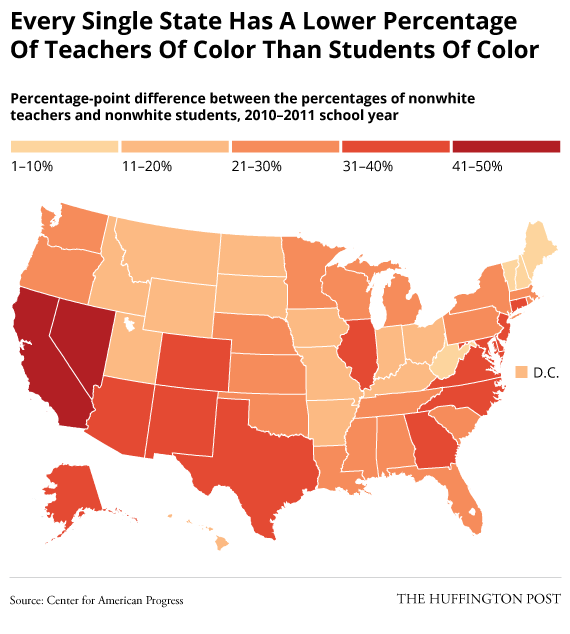 University of Pennsylvania Professor Richard M. Ingersoll and University of Delaware Professor Henry May say that efforts to recruit minority teachers over the past few decades have been largely successful, but teachers of color are quitting at higher rates than their white counterparts. Part of this, the researchers note, may be because minority teachers are more likely to work in high-poverty, hard-to-staff schools where teachers are given little autonomy. 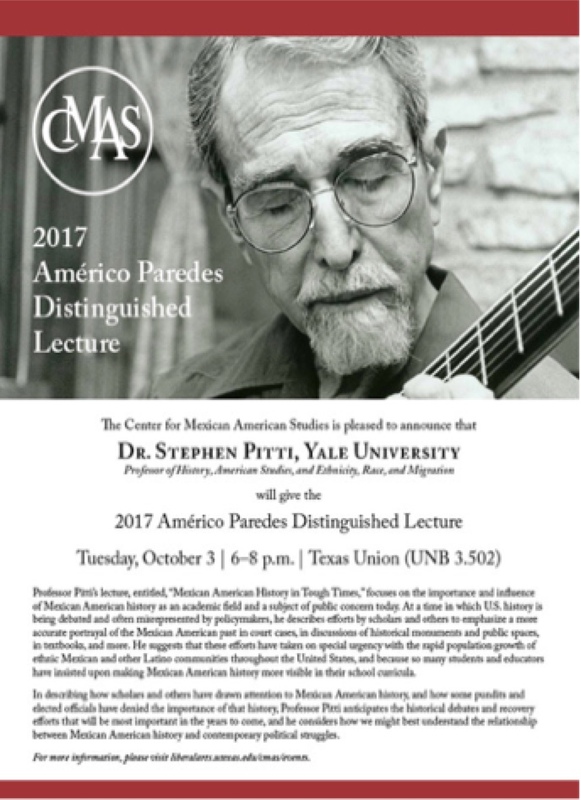 I am so very pleased to have Yale University professor, Dr. Stephen Pitti, delivering this year's Américo Paredes lecture sponsored annually by the Center for Mexican American Studies at UT on the evening of October 3, 2017. Alongside myself and Dr. Nolan Cabrera from the University of Arizona Tucson, Dr. Pitti was one of the expert witnesses in the TUSD-Mexican American Studies court case out of Arizona. I had earlier posted our co-authored op-ed to my blog titled, "The Numbers Won't Speak for Themselves." It reflects on the importance of being community-engaged scholars and the kinds of challenges, but also opportunities it brings. Interestingly enough, the three of us—as well as Dr. John Gonzalez, director of the Center for Mexican American Studies, attended Stanford University as doctoral students although I was a bit ahead of the group. Academia is a small world indeed. Please come and hear Dr. Pitti for what promises to be an engaging presentation! Such a beautiful and profound, if bone-chilling, reflection by Sonny Boy Arias on the Mexico earthquake titled, A View Through the Sociological Lens: When the Mind of the Crowd Takes Over the Mind of the Individual, the Human Spirit Shines. 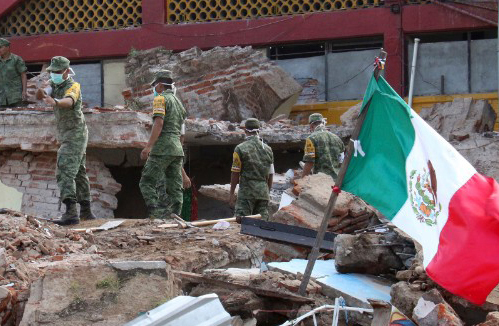 It links poignantly back to the terrifying 1985 Mexico City earthquake of similar strength. Given today's cascade of catastrophes, I ponder on how disasters can change the course of history. Southern Mexico just had an 8.1 earthquake two days ago. We know that the economic and political landscape of any country is permanently disrupted when hit by a serious hurricane, earthquake, flood, fire, or war event. 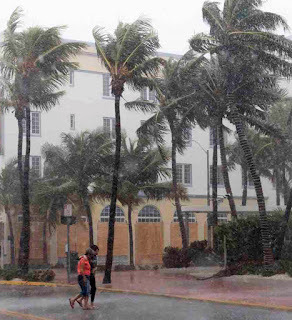 It’s September 9, 2017, in the early morning on the West Coast, and Hurricane Irma with the strength of a Category 5 level threat is upon Florida, and a large part of the United States. I am reminded of the time I was "on the ground" in Mexico City during my days as the Founding Project Director of the Binational English & Spanish Telecommunications Network (BESTNET). The apparent danger I was in didn’t occur to me from the view I had on the 11th floor of Hotel Crystal. I said to the maid, “Are you okay, are you afraid of another earthquake?” And she turned to me and said, “If you look around you will see that all the buildings that fell down were made by the government, yet Hotel Crystal still stands,” and then it struck me: all of our BESTNET staff were safe inside the hotel. 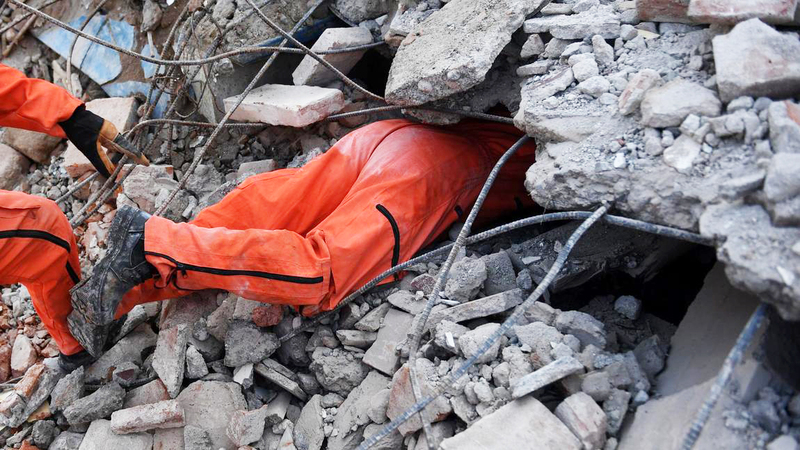 We witnessed trained First Responders from the Mexican Army dig frantically through the pancaked remains of the National Maternity and Pediatric Hospitals in Mexico City. Further on, we saw volunteers, mostly young boys between 12 and 20 years old, working to save doctors-in-training who were trapped in what had been the high rise dormitory of UNAM's medical school. There were very few survivors. A whole generation of Mexico's new doctors was gone. Following the 8.1 earthquake the next night, in spite of a magnitude 7.4 aftershock that sent us scrambling to get out of our hotel, we were able to meet with the Medical Director of that nine-hospital and medical school complex which had been completely destroyed by the quake. Owing to our presence, the Director had quickly organized the first damage assessment of medical facilities and, within two days presented us with the first needs lists that enabled an effective response from the U.S through BESTNET. Although the Internet had not yet been popularized, we utilized BESTNET as a social network to communicate through DECNET, an early encapsulated privatized telecommunications network—a precursor of the Internet known as ARPANET, to communicate binationally. When all other forms of telecommunications were not working, BESTNET was up and running. With our partners, they enlisted the personal jets of regional petroleum corporations to deliver the specifically requested medicines and supplies to Naucalpan's Red Cross Hospital. Ambulances began delivering victims immediately. There were hundreds of them. Direct Relief donations began to arrive that same day. Volunteers received, sorted and dispersed the medicines, supplies and equipment to the hospital, while I worked on site to coordinate the response. Within just a few days, several emergency field hospitals were flown in, and set up nearby to supplement the hospital's capabilities. BESTNET’s consortia of over 20 binational partners were integrated into the over-all medical response social network. I can’t help but think of the accounts and reflections we will hear about as Hurricane Irma looms forward in the next few hours. Living through earthquakes in California, the most recent massive fires and cliff slides in Big Sur, and hurricanes in Texas, I have some experience but don’t really know what it is like to be at the center of a major natural catastrophe. Nature's forces can be very terrifying and even the strongest weep or feel impotent, yet what I do know is it brings out the best of the human spirit as well. I saw this in the many disaster volunteers and professionals we encountered in Mexico, California and Texas. The mind of the crowd (humanity) takes over the mind of the individual and it seems that everyone tries to help under these conditions. Some people arise and become leaders in emergency situations, quickly mobilizing the best they know how, with steady head and purpose, while trying to figure out how to gain access to resources hundreds of miles away from human calamity, and observing them is all-inspiring and a demonstration of great human spirit! Leaders who rise up like this are amongst those many heroes who made a lasting contribution to saving the lives of those that had been spared death but needed medical care and attention, many doing so at the risk of their own lives. Again, I can only imagine what our fellow humans in the Caribbean Islands have experienced and what Floridians will soon be going through because of Hurricane Irma. The destruction of all they have – can you imagine having to endure that? – will be the least of their lasting worries and fears as the hurricane closes ground on them. We are all linked forever to the social network of humanity and to those who are asked without choice to face nature's unforgiving destructive forces and calamities, a choice which we, too, may one day have to face. Sonny Boy Arias is a dedicated contributor to Somos en escrito via his column, Chicano Confidential. Copyright © Arts and Sciences World Press, 2017. Here is an article by Gardenia Mendoza, a writer for El Heraldo, a major Mexican newspaper on the Arizona Mexican American Studies court case that I had meant to post earlier. Nevertheless, it is a great piece because it fosters awareness to Mexicans in Mexico of our Mexican American Studies movement in Arizona and Texas. You can read the Google-translated English-language version of this article here. 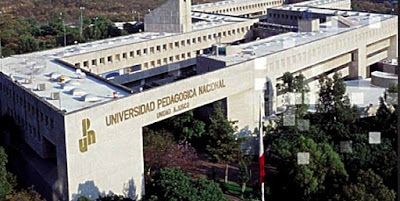 Accordingly, I'm happy to say that I'll be going at the end of the month to the Universidad Pedagógica Nacional in Guadalajara, Jalisco, Mexico, to talk to education/teaching faculty and students about Ethnic Studies in the U.S. and specifically on our work related to Academia Cuauhtli. In light of the fact that approximately half a million children are now in Mexico with their families as a result of deportations and families simply returning because of our current political situation—and with 9 out of 10 of them being U.S. citizens—it is encouraging to consider that Mexico is taking notice of our efforts—presumably to see how they might be able to accommodate them better. This December 2, 2016 article that I posted to my blog provides additional context to this crisis or opportunity, depending on how one looks at this. Thanks to Dr. Olmo Freire for the invitation! Muchísimas gracias! I'll have much more to share on all of this later. Los mexicoamericanos en Arizona se juegan en estos días uno de los asuntos más importantes de su existencia: la identidad que una ley promulgada en 2010 (la HB2281) trató de eliminar de un plumazo al prohibir la matrícula de Estudios México Americanos (MAS, por sus siglas en inglés). Activistas chicanos encabezados por Sean Arce, uno de los fundadores de MAS, y apoyados un equipo de abogados y activistas, llevaron su inconformidad por la HB2281 -promovida por el senador republicano John Huppenthal- al Tribunal de Distrito de los Estados Unidos que desde el 26 de junio debate si es inconstitucional o no. Todo comenzó justo en el distrito de Tucson, en la zona de La Mesilla, el último territorio que se anexó EU de su vecino del sur, donde MAS comenzó a impartir lecciones en 1978 para combatir la segregación racial de las comunidades latinas cuyos estudiantes, “al no sentirse identificados con la matrícula” oficial tienden a abandonar la escuela. Los planes de estudio de la escuela pública de EU prácticamente reduce a dos párrafos la relación bilateral histórica con México. Pasa de largo detalles sobre cómo fue la anexión de California, Nuevo México, Texas y La Mesilla y omite cualquier información sobre comunidades indígenas que no sea el aborigen Squanto, quien fue intérprete aliado de los ingleses y por quien se celebra el Día de Acción de Gracias. En cambio, los Centros de Estudios Étnicos mexicanos, tanto en Arizona como en California, Nuevo México, Colorado, Minessota, Oregon y Texas (donde se imparten), ponen el foco en las culturas indígenas de los estudiantes como la academia Cuautli en Austin, que preside Ángela Valenzuela, donde incluso se enseña el náhuatl y danzas prehispánicas. Otros temas en sus planes de estudio son la migración, los derechos civiles y el colonialismo mayoritariamente ignorados en los planes oficiales. MAS de Tucson incluyó a 12 autores lo que enfureció a los republicanos y quedaron prohibidos con la HB2281. Entre ellos varios chicanos que hablan sobre los indocumentados (Sandra Cisneros, con The House of Mango y Francisco Jiménez con Life of a Migrant Child); un dominicano que describe sobre ser foráneo en New Jersey (Junot Diaz, con Drown); el finalista del premio Pullitzer Luis Urrea, con The Devil’s Highway y hasta William Shakespeare, con The Tempest. Para los gobernantes que votaron a favor de la HB2281 en Arizona estas obras y en general las enseñanzas de los Centros de Estudios promueven el derrocamiento del gobierno de los Estados Unidos y el resentimiento hacia una raza o clase de personas porque sólo toman en cuenta a un grupo étnico particular y abogan por la solidaridad étnica en lugar del tratamiento de los alumnos como individuos. Los argumentos que ignoraron fueron las ventajas. Del hecho de que cualquier interesado de cualquier raza tendría acceso desde niños para tomar estos cursos y entender un poco más a los 30 millones de mexicanos que viven en la Unión Americana con raíces que no pueden negar pero que aún quieren a América con menos racismo. Besides the 16 de Septiembre, the celebration of Mexico's independence from Spain, there is a lot going on this weekend at the Emma S. Barrientos Mexican American Cultural Center (ESB-MACC) located at 600 River in Austin, Texas. 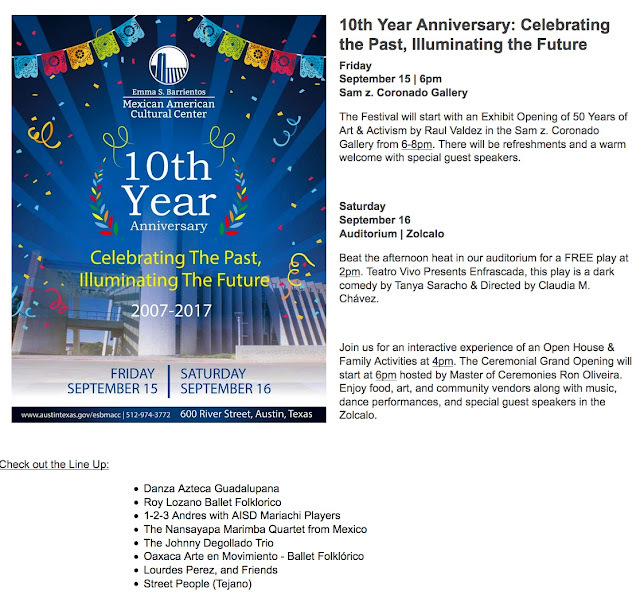 Open to the public, it's going to be a fantastic celebration. Check out my earlier post from yesterday that briefly recounts the ESB-MACC's long and winding history. Located downtown off of Town Lake, the beautiful ESB-MACC is also home to Academia Cuauhtli/Cuauhtli Academy, a Saturday school that is now in its fourth year of operation. Cuauhtli offers a rich, Spanish-only curriculum to fourth graders attending Sanchez, Metz, Zavala, Houston, and Perez elementary schools—all Title I schools located in east Austin. Honor our community’s cultural heritage, foster a social justice consciousness, and reclaim our collective identities in pursuit of educational freedom. This is NOT a charter school. This is a formal, legal partnership that consists of our community-based organization, Nuestro Grupo, the Austin Independent School District (AISD), and the City of Austin's ESB-MACC. 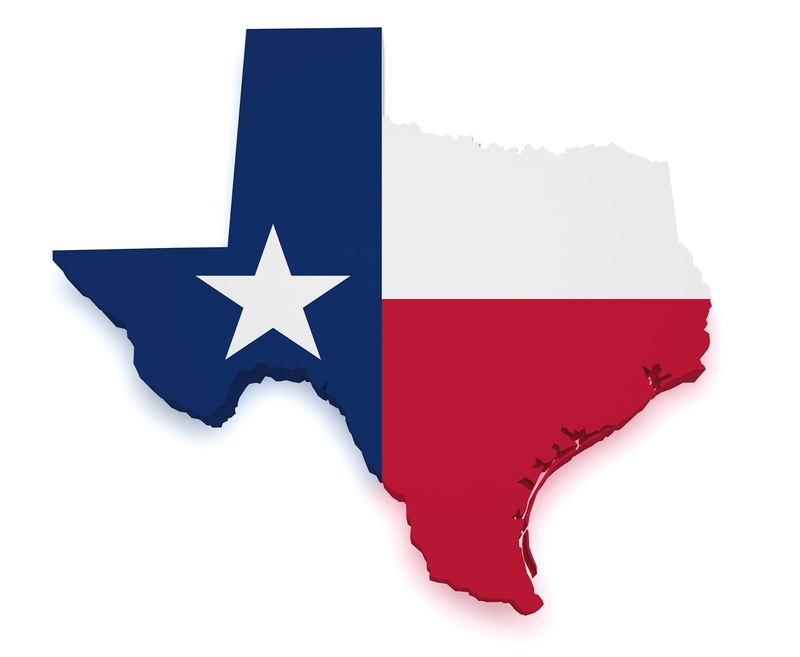 This coming year, additional formal partners are Education Austin and the Austin Area Association for Bilingual Education (AAABE). Thanks to Gardenia Mendoza, a columnist with one of Mexico's leading newspapers, El Heraldo—and Franc Contreras who faciitated my conversation with Gardenia—Academia Cuauhtli has also received a bit of international notoriety via this piece titled, "Ser or No Ser Azteca," meaning "To be or not be Aztec." Academia Cuauhtli is a curriculum development and teacher professional development site that offers instruction based on a co-constructed, TEKS-aligned, curriculum in civil rights, local history, immigration/migration, Tejano history, the cultural arts, and indigenous heritage. With excellent instruction from maestra Rosa Tupina Yaotonalcauhtli, maestro Quiahuitl, and Kalpulli Teokalli Teoyolotl our curriculum offers danza Mexica and basic Nahuatl. Close to half of all of the curriculum that we have produced is available in AISD district-wide in English and Spanish in grades 3, 4, 5, 6, 7, and 11. This year, Cameron Allen, who is the Executive Directo of The Seed project at Houston Elementary School (español), will also be offering English as a Second language instruction to the chidren's parents and grandparents while their children and grandchildren are in Saturday morning school at Cuauhtli. Thanks to all the people that make it work. At the ESB-MACC, these include Director Herlinda Zamora, Linda Crockett, Marina Islas, Lori Navarrette, Frank Baca, Ulises Garcia, Esteban Salas, Tina Herrera, Josh Gomez, Ernesto Garza, Matthew Rodriguez, and Anthony Garcia. Special thanks, as well, to Laura Esparza, the Division Manager for Cultural Affairs in the Parks and Recreation Department of the City of Austin. Thanks to Dr. David Kauffman, AISD Executive Director of English Language of Multilingual Education, Claudia Santa Maria, Assistant Director of Elementary Dual Language, and Erica Baker AISD staff for their deep commitment to our program. Many, many thanks, as well, to AISD Superintendent Paul Cruz, Edmund R. Oropez, Chief Officer for Teaching and Learning, for their unflagging support, and former AISD Board Member Paul Saldaña for encouraging overall AISD board support for our program. Thanks to Montserrat Garibay with Education Austin for her friendship and co-sponsorship support over the years. Lupe Ramos with AAABE has also been an unflagging supporter such that together with Education Austin, nearly all if not all of our participating teachers are both AAABE and Education Austin (NEA "union" members). Other co-sponsors include the LLILAS / Benson - UT College of Liberal Arts—a shout out to Lindsey Engelman—and the Center for Mexican American Studies, including support from directors, past and present, respectively, Dr. Domino Perez and Dr. John Gonzalez. Both the Multicultural Engagement Center and the Division of Diversity and Community Engagement at UT have gifted us with support for our events, as well. We always remember AISD's former Chief Academic Officer Dr. Pauline Dow who was instrumental in getting our partnership launched in 2014, followed by an inauguration on January 17, 2015. Dr. Emilio Zamora, Martha Cotera, Modesta Trevino, Oralia Garza de Cortes, Brenda Rubio, Randy Bell (co-coordinator), Anthony Martinez (co-coordinator), Dr. Christopher Milk, Alonzo René Mendoza, Irene Gomez, Alicia Guerrero, Rebeca Ríos, Vasti Saraí Ríos, Dr. Emma Mancha-Sumners, Dr. Isabel A. Millán, Gina Tillis, Larissa Davila, Julia Hernandez, Kristina Gutierrez, Dr. Jesse Gainer, Nancy Valdez-Gainer, Juan Ramirez, Belinda Jiménez, Manuel Martinez, Luis Ramirez, Julia Hernandez, Yvette Cardenas, Fernando Rios, A.J. Hope, Jennifer Ross, Beatriz Hernandez, Clarissa Riojas, Tiffany Moreno, Brenda Ayala, Noreen Rodriguez, Martha Sanchez, Olivia C. Hernandez, Dr. Manuel Xavier Zamarripa, and Jessica Ochoa Zamarripa. For our legendary spring field trip to the Alamo in San Antonio, Drs. Andrés Tijerina and Gilberto Hinojosa have given generously of their time to share their knowledge and expertise on the deeper, more complete story of the Alamo than anyone can possibly get there as a tourist or visitor. Patricia Nuñez, Belinda Jimenez, Sandra Velazquez, Danny Ramos, Santa Yanez-Montemayor, Gladiola Campos, Michelle Yanes, Manuel Martinez, Luz Alvarez-Sims, Veronica Rivera Garay, Diana Rendon, David Carrillo, Katheline Alcantara, Julia Carrillo, Liliana Batista, Rodrigo Rodriguez Tovar, Lucy Castellano, Eliza Saenz, Nelson Aguilar, and Kathi Peterka. Many, if not most, of our teachers come out of Proyecto Maestría at the University of Texas at Austin, headed by Dr. Deb Palmer and Dr. Haydee Rodriguez. Largely because of their great sacrifices and efforts, we have a robust bilingual education teacher's movement in Central Texas. Thanks to all of our Academia Cuauhtli parents for sharing your amazing children with us—and for being the blessing to our community that you are. Consider liking us on Facebook. With a brand new crop of volunteers ready to take on our many tasks, we collectively await and anticipate another exciting year!